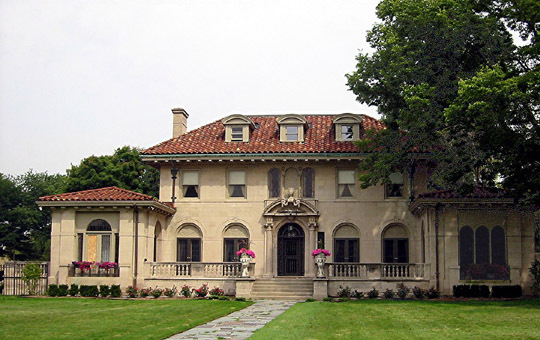 The Michelson-Young Estate, more popularly known as the Gordy Mansion or the Motown Mansion, is one of the larger and more elegant homes located in the City of Detroit. It has a storied history and has been owned by several of the city’s most prosperous individuals, most popularly known among them, Berry Gordy, Jr., founder of Motown Records. Interestingly, each of the owners was a self-made millionaire in his time and was a tremendous visionary. One owner, fresco-artist Pablo Davis, known for his work with Diego Rivera at the Detroit Institute of Arts, has his work on permanent display with the Smithsonian Institute in Washington, D.C. This Italian Renaissance design of the main residence was built in 1917 by Nels Michelson, a Michigan lumber and timber baron. In 1926, the second owner, L.A. Young, substantially renovated the main residence and added a 4,500 square foot athletic building to the two acre estate. Nels Michelson, the original owner and builder of the mansion, was born in Denmark on November 25, 1840. He journeyed to America in 1866 to seek his fortune. Cholera broke out on the ship which carried Nels to the New World and he and the other passengers were held in quarantine in New York for two months during which time two hundred of the passengers died aboard the ship. When he was released from quarantine, Nels, who was penniless, eventually traveled to Manistee, Michigan where he worked in a lumber camp for a dollar a day. After two years, he had saved enough money to purchase a team of horses, which allowed him to secure a contract for hauling supplies to the lumber camp. In 1869, he joined with Rasmus Hanson, combining their total capital of fifteen dollars to purchase an outfit which they could use to contract for transporting logs out of the area. By 1889 they had organized the Michelson and Hanson Lumber Company and in 1895 he started purchasing land near Houghton Lake until he owned about 500,000 acres. In 1908 he organized the N. Michelson Lumber Company and built two large mills, a sawmill and a shingle mill. Foreseeing that Detroit was about to explode from a city of 400,000 to over a million, he organized the Michelson Land and Home Company and purchased over one thousand acres of land along Woodward Avenue which he developed and is now known as Ferndale, Michigan. In 1917 he built the Mansion and moved in with his family the following year. In addition to the legacy of land that Nels Michelson donated, his family also made important contributions to the State. The very popular Hartwick Pines State Park is located on eight thousand acres of land that his daughter, Karen Michelson Hartwick, donated to the State of Michigan. She had the park named for her husband who was killed in World War I and supported the creation of the Hartwick Pines Logging Museum that was opened in the 1930s. She also had two of the lakes in the park named for her father’s favorite oxen. Leonard Augustus Young was the second owner of the mansion, purchasing it in 1925 from the Michelson estate. He started his career as a travelling salesman; however, on one sales trip he acquired five patents for coil springs. Using an I.O.U., he purchased the bankrupt Detroit Wire Spring Company, which was producing one of his spring designs, the Royal Arch cushion spring. He renamed the company L. A. Young Spring and Wire Corporation and, selling springs to the auto industry, became a millionaire. During his career, Mr. Young held more than 70 patents on various spring constructions. Mr. Michelson’s contributions to the mansion focused on the ornate woodwork in the mansion and superior construction. The main residence consists of approximately 8,500 square feet of space with nine bedrooms, four fireplaces and five full baths. The carriage house can accommodate five cars and includes two apartments above. As a man who made his fortune from laboring in the woods, the mansion was somewhat modest while owned by Mr. Michelson. Mr. Young, however, substantially renovated the mansion and is credited with the addition of the intricate bronze entry doors, ornately carved marble fireplace mantels, custom-designed light fixtures, the marble fountains and ornate stained glass. He also added an authentic English pub and wine cellar to the property. An athlete, Mr. Young held five national titles in equestrian sports. Perhaps as a result of the influence of the Kellogg Institute, which was touting the benefits of a healthy living style, he added the athletic building with an Olympic-sized swimming pool, bowling alley, gymnasium, “electric vapor room” (steam room) and oak-paneled billiards room. An early investor in MGM studios, Mr. Young also had installed a movie theater and screen in the athletic building for private viewings of first run movies. Clearly, these additions were ahead of their time and are still sought in higher end homes being constructed today. Pablo Davis was the third owner of the Mansion, acquiring the property in 1964 from the Young family. As a young man, Pablo worked with Pablo Picasso and Diego Rivera (along with Frida Kahlo). He has worked with many notable talents in art and entertainment, including Charlie Chaplin, Eleanor Roosevelt, Paul Robeson, W.E.B. DuBois, Jackson Pollock, Jane Fonda, and Donald Sutherland. He counts among the people he has painted Katherine Hepburn, Marilyn Monroe, Barbra Streisand, and Pete Seeger. He was also an illustrator for The Saturday Evening Post, the Woman’s Home Companion and several books. Mr. Davis owned the home from approximately 1964 until he sold it in 1967. Mr. Davis split the property into two parcels, the main residence, where he lived and the athletic building, which became the residence of a new owner, Max Grozesky, a librarian who worked for Wylie E. Groves High School in Birmingham. Not much is known about Mr. Gozesky. Berry Gordy, Jr., the founder of Motown Records, acquired the Residence in 1969 from Max Gozesky and Pablo Davis. In purchasing both parcels, Mr. Gordy re-combined the parcels into a single property. Berry Gordy did what many people of his time believed could never be done: he brought Black music into millions of American homes, helping both Black artists and their culture gain acceptance, and opening the door for a multitude of successful Black record executives and producers. As the fourth owner of the mansion, Mr. Gordy made a significant financial investment in the property, including a complete renovation of the kitchen. During his ownership, the mansion was the site of fabulous parties featuring Motown artists. 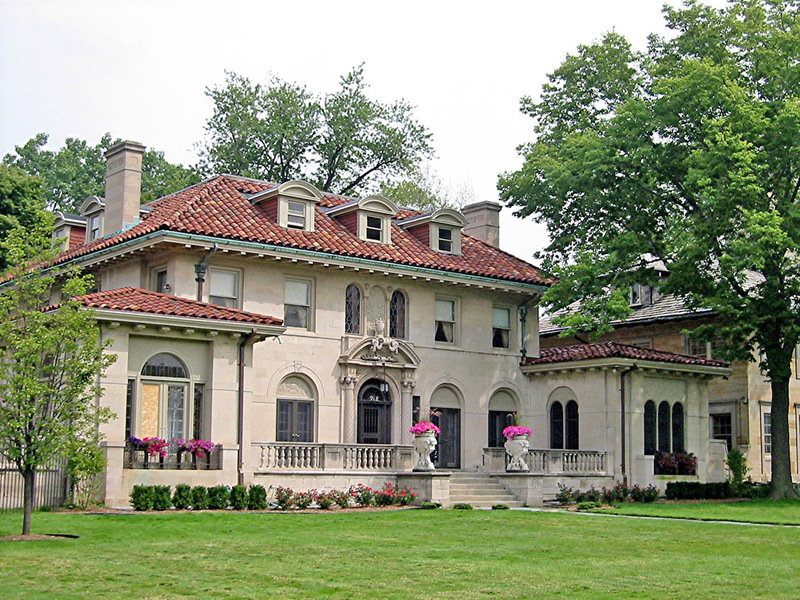 Importantly, the mansion served as the backdrop for gatherings of the social and political elite of the City of Detroit. Several books make reference to the property, including books by Mary Wilson, Diana Ross and the Jacksons. In the early 70’s Gordy pulled up stakes in Detroit and relocated the multi-million dollar operation to Los Angeles Although Mr. Gordy lived in California, he continued to own and maintain the property for another twenty years, retaining it for his visits to Detroit. As a result of his ownership, the mansion kept all of its original light fixtures, hardware, stained glass and other historic appointments adding to the unique beauty of this fine estate. In 2002, Berry Gordy sold the mansion to attorney Cynthia F. Reaves. Ms. Reaves is a nationally known attorney whose practice focuses on tax-exempt work and work in the health care industry. Ms. Reaves provided counsel to former President William Clinton on his universal health reform act. Additionally, she served as counsel to former President Jimmy Carter in his work with Habitat for Humanity. As an active member of her community, Ms. Reaves restored the mansion with the intention of allowing it to reclaim its place as a gathering place for political and social leaders. Ms. Reaves sold the mansion to a private party. Use in 2011: Private residence. District, listed January 1, 1974.